Hey everyone! My name is Heather Berg, and I’m another one of the summer guides working for the admissions office this summer. While I’m originally from South Florida, I’ve definitely found my home here at UVA. I’m a rising second year, and this year I’ll be applying to the Batten School of Leadership and Public Policy, and I’m also minoring in Global Studies in Education. I’m part of the University Judiciary Committee, University Programs Council, and I volunteer weekly at a daycare through Madison House. I’ll be sporadically contributing to these blog posts, so feel free to drop me a note if you have questions about anything I talk about! Before I began my time as a student here, I remember coming to visit for Days on the Lawn weekend. I stood on the steps of the Office of Admissions with no idea where to go, until a current student came up and start chatting with me. As we made small talk, I mentioned how excited I was to begin my freshman year here. That was a mistake. The student, still a good friend of mine, was quick to remind me that I would not be a “freshman”; I would be a “first year”. I was not on our “campus”; I was on our “Grounds”. Why did all this matter? I asked myself. Did it really make a difference whether I referred to myself as a “freshman” or as a “first year”? Well turns out, there’s quite a bit of historical context that plays into UVA’s lingo. Thomas Jefferson was a big believer in lifelong education. He did not feel education could be confined to just the four years spent at his University. No one could be “fresh” at anything; no one could be a “senior” at anything. Rather, all of us were on a lifelong process of continuing our education beyond just UVA. 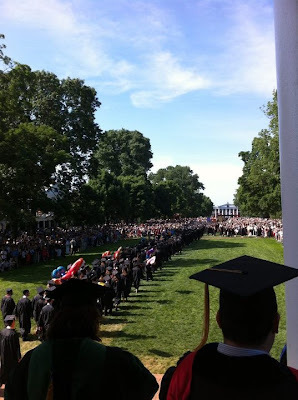 UVA Students walk the Lawn at this year's Final Exercises. As far as why I’m writing this blog post from “Grounds” and not from a “campus”, I think that’s just one of those things that has been done a certain way for years now, and has carried through to today. That’s one of the greatest things about UVA--we’re a school that’s so rich in traditions, from our own set of lingo, to our “Girls in Pearls, Guys in Ties” attire at football games, to many of the items on our “List of things to do before you graduate”. It all begins at Convocation, which is the welcoming ceremony for our first years each fall. We begin our time on UVA’s lawn, with a welcome address from the President. We face the Rotunda, symbolizing our readiness to make our mark on this University for the next four years. At the end of our time, during our graduation ceremony (which we call Final Exercises) we walk away from the Rotunda. Marching from the Rotunda down the Lawn, we symbolically turn away from the University and towards the real world. We use the knowledge gained during our time at UVA to begin our lives as future leaders, wearing the “Honor of Honors”. From the beginning to the end of our time here at UVA--starting with Convocation and ending with final exercises and every day in between--we live out legacies that have been passed down from generation to generation. I love knowing that Jefferson’s vision for his “Academical Village” still carries through to today, and every tradition we have just makes our experience that much more unforgettable. I’ll never quite be ready for those Final Exercises, when I need to walk away from the University that I love so much, but all the more reason for me to enjoy every second of my time here! Wahoowa! 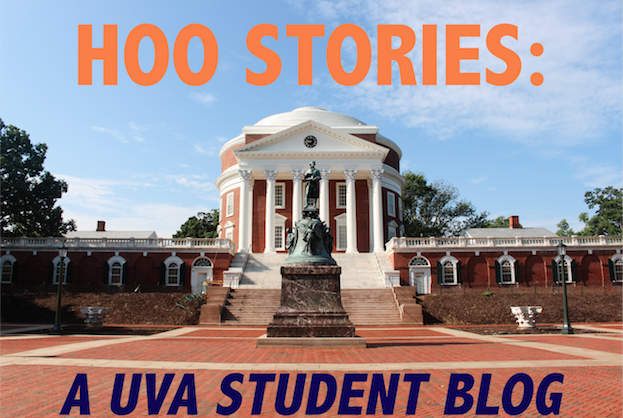 Welcome to Hoo Stories, a UVA student blog for prospective students! My name is Sam Atkeson and I'm one of the tour guides working in the office of admission this summer. A little bit about myself—I'm a rising third year student originally from Falls Church, Virginia, studying Spanish and Political & Social Thought. I transferred to UVA this past fall and it was the best decision I've ever made. In the classroom my interests include foreign affairs, history, anthropology and issues involving globalization and development. In my free time I give historical and admissions tours as a member of the Guide Service, and I'm an ESOL tutor at a local elementary school through UVA's volunteer hub Madison House. I also serve on the Student Council as a College Representative as well as a member of the Public Affairs committee. Over the course of the summer, my fellow tour guides and I will be blogging regularly about various facets of student life here at UVA. We'll be writing about topics like traditions, student life, research opportunities, athletics, academic programs and much more. There will also be periodic chat sessions for you all to ask us any specific questions you have, so be on the lookout for the dates and times for those. We look forward to sharing our stories with you guys this summer, and if there are any topics that you are particularly interested in, feel free to comment and let us know!